I’m a sucker for a good job search story. 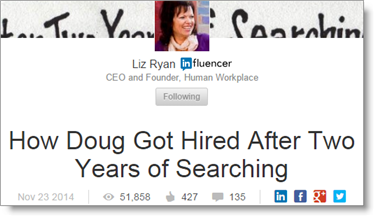 Enter a LinkedIn article by Liz Ryan, where she shares an awesome, inspiring letter from one of her job seeker clients, and then her reply. Please read the entire thing – it’s kind of long but if you are in a job search, this will give you a boost that you just can’t get enough of! Doug’s story is our story… your story, my story. We think that if we do a great job, we’ll have security (“I thought I was going to retire from that job.”). We think that we can send out hundreds of resumes, because it’s a “numbers game,” and eventually someone is going to interview us and hire us. We are absolutely appalled at the resume black hole and the salt-in-the-wound auto-responders. Finally, when something comes along that gives us a semblance of control, we gravitate towards that. We thirst for control, since we feel like we’ve been thrust into this dark fantasy world where we have NO control. Doug talks about “Pain Letters” and a “consulting business card.” It’s a great letter – read it here. “The second assignment is to write to everyone you met in your job search, and thank them. Tell them where you landed and thank them for their support, even if they didn’t really do anything. This is such a powerful assignment. I don’t even want to call it a recommendation because I think that devalues it. It’s not a suggestion… this is a must-do assignment. And the job seekers says “Yes, of course, I’ll never let my network get stagnant again!” You feel repentant, you are humbled, and even though you don’t like networking, you swear you won’t fall behind on your relationships again. BUT YOU DO. You get busy onboarding yourself at your next job. You can take a breather and release the stress of being unemployed. You get to play a bit, and of course you don’t have to go to any networking events. Whatever resolution you had gets swept away in the new routines. YOu aren’t bad… you just need some ideas on how to network moving forward. And Liz’s assignment, to reach out to every person you met in your job search (and the people you knew before that, who you were in touch with during your job search), is THE TACTIC that you need to pursue.